Kids are some of the most finicky eaters on the planet. They can also be some of the most stubborn. Parents will try anything to get their kids to eat what’s put in front of them. In the end though, parents love their kids and will allow them to eat whatever they want just to make sure they eat. But what are they eating? Many of the foods our kids might choose to eat may not exactly be on the healthy side. Even if the child is considered to be somewhat active it just may not be enough to keep them from gaining a large amount of weight. 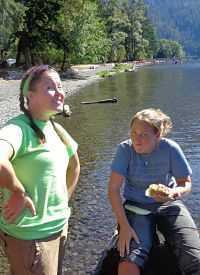 Rites of Passage NW Wilderness Therapy weight loss camp for kids in Seattle can be just as beneficial to the parents as the kids. Even at 10 years of age, kids have a tremendous learning capacity. They also have the ability to teach to anyone willing to learn. At Rites of Passage NW, it’s all about learning about themselves and changing their unhealthy behaviors. Learning to lead a healthy life style at an early age can be beneficial to themselves as well as those they live with. A family willing to make lifestyle changes in their home can definitely change a kids life forever. Without conscious thought, our students will have fun, lose weight and detox their body’s of the sugars and fats they have been consuming. They will learn how to prepare delicious holistic meals. During wilderness treks and adventures, our students learn new skills and use the strengths and abilities they didn’t know they had to work through many challenges. They will be emotionally prepared to overcome the obstacles they will face when they leave. For more information regarding our highly effective weight loss camp for kids in Seattle, contact us today at Rites of Passage NW Wilderness Therapy (800)794-0980. Guiding families to health and wellness.